A ferrofluid is a liquid containing very small ferromagnetic particles (magnetite). These particles are only a few nanometres in size (0,00001 mm). 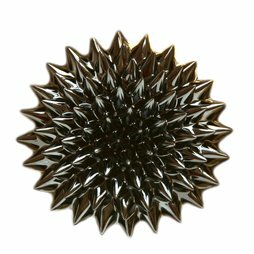 Because of these particles, the liquid reacts strongly to magnetic fields: As soon as a strong magnet approaches the ferrofluid, countless spikes form (see the following photos and videos). Since ferrofluid creates stains on clothing that cannot be removed, we recommend wearing old clothing or an apron while experimenting. It also leaves hard to remove stains on the skin, hence, you should wear gloves and protective glasses. These protective accessories are not included in the delivery. This video shows how you can bring your own ferrofluid sculptures to life. You only need metal screws, a strong neodymium magnet (e.g. S-15-08-N), protective gear, a paper plate, and a bottle of ferrofluid. Don't miss the mess at the end: That shows how not to do it. The complete content of the flask in a water glass. The tiny magnetite particles are suspended in a liquid that is somewhat comparable to motor oil. Here we hold a magnet beneath the glass, close to the ferrofluid. We can see how the spikes form and how the spikes follow the magnetic field lines of the magnet. The stronger the magnetic field the denser and more pointy these spikes become. Here we used a stronger magnet than in the previous picture. Visibly more spikes have formed in this case. Normally, fluids are not ferromagnetic, which means they are not attracted by a magnet. When you manage to get tiny iron particles floating in a fluid without clumping together or sinking to the bottom, then you have a ferromagnetic fluid that reacts to a magnetic field, a so-called "ferrofluid". If you then place a super magnet near the ferrofluid, you can watch all sorts of weird behaviour. Ferrofluid is typically only industrially used, for instance during the production of loudspeakers. In our webshop, you can get the ferrofluid in small bottles with a pipette so you can make your own experiments with this fascinating fluid.